Sea squirts or tunicates are a group of animals which are entirely found in the sea. They are divided into three major groups: salps and appendicularians which are planktonic and spend their adult lives drifting in the sea and ascidians which are attached to or buried in the seabed as adults. The Tunicata are classified as a subphylum of the Chordata which includes fish and higher vertebrates and are thus of particular interest in the study of the origin of the vertebrates. Many ascidians are fast growing and fast reproducing and may be fouling organisms on artificial substrata such as boats or harbours. Some species are solitary whilst others are colonial, with many zooids being produced by budding from an initial settler. Pyura microcosmus is of interest in a Northern Ireland context in being a characteristic and moderately long-lived component of horse mussel beds in Strangford Lough. Sensitive to climate change. As this species is more common farther south it may increase if water temperatures around Northern Ireland increase, or disappear if the water becomes colder. A dirty brown, wrinkled solitary ascidian recorded in the literature as growing to 3cm in length, but up to 5cm in local populations. The test is very thick and leathery and is wrinkled even when the animal is fully expanded. It is covered with detritus, algae and other attached plants and animals making it inconspicuous apart from the extended feeding siphons. These siphons are fairly long when fully expanded, but sensitive to light or disturbance so that they quickly contract on close inspection. They are longitudinally marked with red and white lines, most obvious on the inner surfaces. The openings become square and fluted in partial contraction. Individuals are hermaphrodite with two gonads on one side of the body and one on the other. Eggs are released into the sea and fertilised there, developing into so-called tadpole larvae, which swim for a while before settling and attaching to the bottom. This is called oviparous development; many other tunicates are viviparous, brooding fertilised eggs within the tunic until they become tadpole larvae, which are then expelled into the water to swim and settle. This species belongs to the family Pyuridae which includes several smaller similar species. It can be distinguished from other species by the two gonads on the right-hand side of the body but must be dissected to confirm this. Similar looking species have only one gonad on each side. This species can be found amongst living horse mussels in Strangford Lough, where it was formerly a common member of this community. This is a species primarily confined to horse mussel beds in Northern Ireland where it used to be present in tens per square metre. Investigations in 2003 confirmed that the Strangford Lough horse mussel beds have declined considerably in the past 30 years and this species in particular seems to have become rare, with only a few small individuals present. The current status of this species is not clear and it may be undergoing a natural fluctuation in its populations. It is inconspicuous to any methods other than direct observation by experienced marine biologist divers or destructive quantitative sampling of the biogenic reefs where it lives. 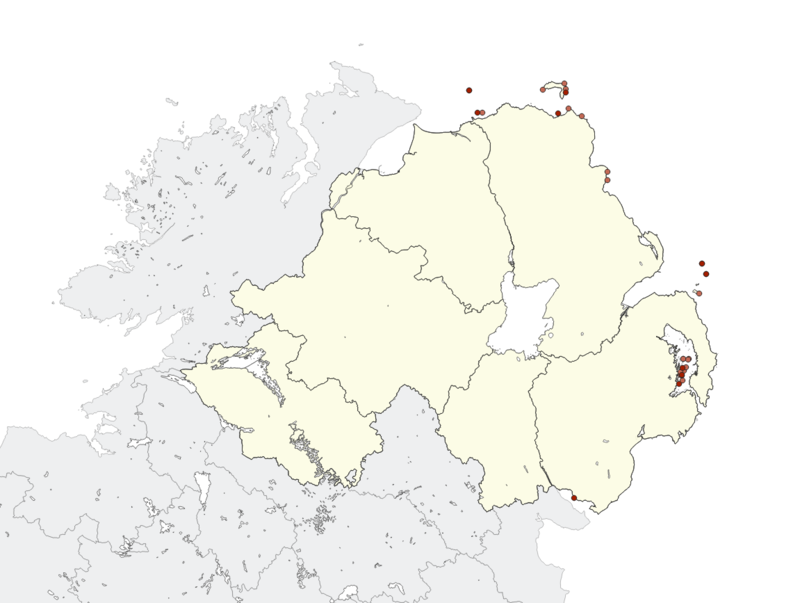 There are scattered records from the Copeland Islands, the Antrim coast and the Skerries at Portrush but no dense populations are known from the Northern Ireland open coast. Similar horse mussel beds in Loch Creran, Scotland have this species as a major component of the epifauna. In rapid decline due to physical impact of bottom fishing gear in its habitat. The target for the fishery is the queen scallop, Aequipecten opercularis, which lives in more open muddy patches between the horse mussel clumps, but requires stable biogenic reefs for successful recruitment. It is unclear whether direct impact from trawling has disrupted the mussel beds and encouraged predatory starfish or whether smothering by stirred up bottom sediments is more to blame for their decline. Implementation of the Northern Ireland habitat action plan for Modiolus modiolus beds. As with most underwater species these animals are only normally seen by divers, but any new populations of this species should be notified to CEDaR, National Museums Northern Ireland, 153 Bangor Road, Cultra, Co. Down, BT18 0EU. Tel: 028 9039 5257, cedar.info [at] nmni.com. Divers are encouraged to record species and habitats through involvement with the SeaSearch programme (www.seasearch.org.uk) which has a Northern Ireland co-ordinator.